Our Story - Pedal The Rails! Vance Creek Railriders is operated by Doug and Cynthia Newman. Doug and Cynthia have been longtime family friends with Railriders founders Kim and Anita Metlen. 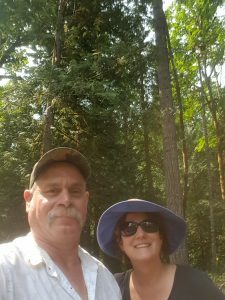 Kim and Doug met more than 30 years ago skiing as members of the Anthony Lakes Ski Patrol. The Metlens wanted to expand and open a new Railriders site in the lush forests in Washington on a historic portion of the old Simpson Timber line in Shelton Washington and with our love of the outdoors; we were ready for a new adventure. Kim and Anita Metlen have long been active cyclists, involved with the development of bicycle tourism in northeast Oregon and across the state. They were leaders in the development and designation of the Grande Tour Scenic Bikeway, under a program of Travel Oregon and the Oregon Department of Parks & Recreation. Admired nationally, the Oregon Scenic Bikeways Program is unique to Oregon and patterned after the state’s acclaimed scenic byways program. Since 2013, they have been involved with the effort to install a multi-use trail parallel to the track from Elgin to Joseph. The couple owned and operated Mountainworks Bike Shop in La Grande for several years, before selling the shop to their daughter and her husband, Mavis and Whitfield Hartz. Advocates for fitness and fans of history and nature, the Metlens admired the scenic beauty of the Wallowa Union Railroad (Historically known as the Joseph Branch), a 63-mile line that connects Elgin with Joseph and links the communities between. They wondered how they could follow their passions while utilizing a section of railroad that is not currently used for excursion train rides. After researching about railriders in other parts of the world and discovering a similar business in the Eastern Unites States, the idea for Joseph Branch Railriders was born. With help from local manufacturing companies, Kim designed and fabricated the rail units and they were first tested on the rail line fall of 2013. After acquiring permission from the Wallowa Union Railroad Authority and setting up a base of operations on Main Street in Joseph, Joseph Branch Railriders grand opening was celebrated May 23, 2014. Oregon Coast Railriders began operation in 2016 and Vance Creek Railriders began operation in 2018.